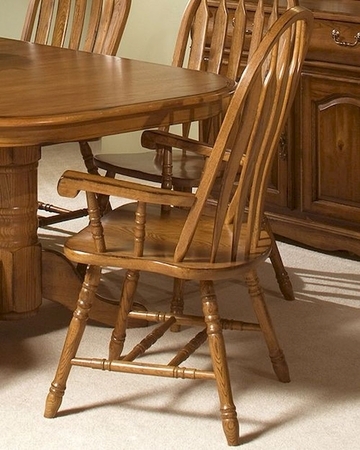 Intercon Detailed Arrow Back Arm Chair Classic Oak INCO247SHA (Set of 2). The Classic Oak Detailed Arrow Back Arm Chairs From Intercon Is Made From Solid Oak And Finished In Burnished Rustic or Chestnut. 2 x Detailed Arrow Back Arm Chair IN-CO-CH-247SHA-BRU-SU. 2 x Detailed Arrow Back Arm Chair IN-CO-CH-247SHA-CNT-SU. Arm Chair - 26"W x 19"D x 40"H.